, a celebrated sophist of antiquity, was born of an ancient and noble family at Antioch, on the Orontes, in the year 314. Suidas calls his father “Phasganius” but this was the name of one of his uncles; the other, who was the elder, was named Panolbius. His great-grandfather, who excelled in the art of divination, had published some pieces in Latin, which occasioned his being supposed by some, but falsely, to be an Italian. His maternal and paternal grandfathers were eminent in rank and in eloquence; the latter, with his brother Brasidas, was put to death by the order of Dioclesian, in the year 303, after the tumult of the tyrant Eugenius. 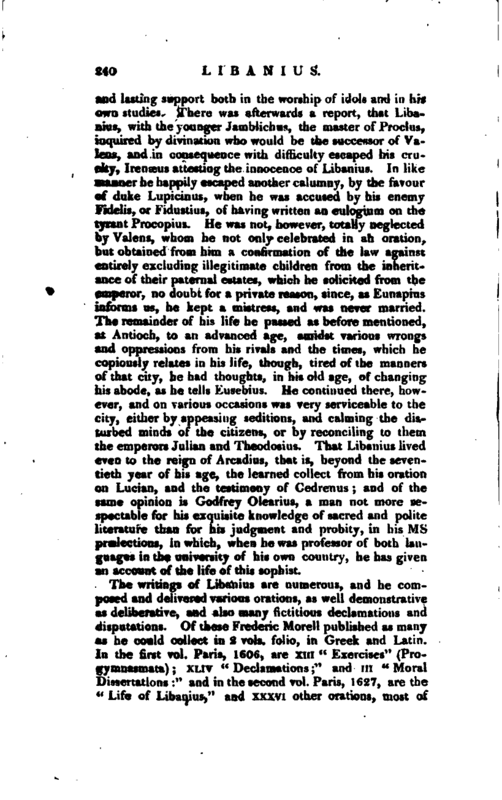 Libanius, the second of his father’s three sons, in the fifteenth year of his age, wishing to devote himself entirely to literature, complains that he met with some “shadoxvs of sophists.” Then, assisted by a proper master, he began to read the ancient writers at Antioch; and thence, with Jasion, a Cappadocian, went to Athens, and residing there for more than four years, became intimately acquainted with Crispinus of Heraclea, | who, he says, “enriched him afterwards with books at Nicomedia, and went, but seldom, to the schools of Diophantus.” At Constantinople he ingratiated himself with Nicocles of Lacedosmon (a grammarian, who was master to the emperor Julian), and the sophist Bermarchius. Returning to Athens, and soliciting the office of a professor, which the proconsul had before intended for him when he was twenty- five years of age, a certain Cappadocian happened to be preferred to him. 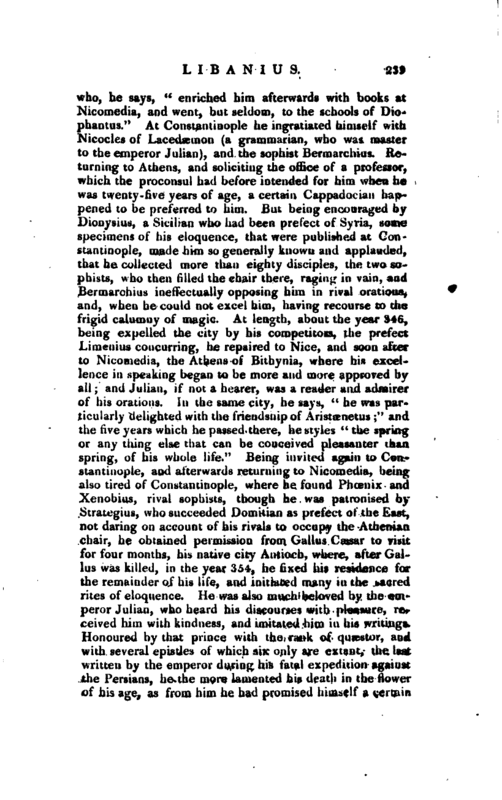 But being encouraged by Dionysius, a Sicilian who had been prefect of Syria, some specimens of his eloquence, that were published at Constantinople, made him so generally known and applauded, that he collected more than eighty disciples, the two sophists, who then filled the chair there, raging in vain, and Bermarchius ineffectually opposing him in rival orations, and, when he could not excel him, having recourse to the frigid calumny of magic. At length, about the year 346, being expelled the city by his competitors, the prefect Limenius concurring, he repaired to Nice, and soon after to Nicomedia, the Athens of Bithynia, where his excellence in speaking began to be more and more approved by all; and Julian, if not a hearer, was a reader and admirer of his orations. In the dame’city, he says, “he was particularly delighted with the friendship of Aristaenetus;” and the five years which he passed there, he styles “the spring or any thing else that can be conceived pleasanter than spring, of his whole life.” Being invited again to Constantinople, and afterwards returning to Nicomedia, being also tired of Constantinople, where he found Phoenix and Xenobius, rival sophists, though he was patronised by Strategius, who succeeded Domitian as prefect of the East, not daring on account of his rivals to occupy the Athenian chair, he obtained permission from Gallus Cassar to visit for four months, his native city Antioch, where, after Gallus was killed, in the year 354, he fixed his residence for the remainder of his life, and initiated many in the sacred rites of eloquence. He was also much beloved by the emperor Julian, who heard his discourses with pleasure, received him with kindness, and imitated him in his writings. Honoured by that prince with the rank of quaestor, and with several epistles of which six only are extant, the‘ last written by the emperor during’ his fatal expedition against the Persians, he the more lamented his death in the flower of Ms age, as from him he had promised himself a certain | and lasting support both in the worship of idols and in his own studies. There was afterwards a report, that Liba­Ihus, with the younger Jamblichus, the master of Proclus, inquired by divination who would be the successor of Valens, and ia consequence with difficulty escaped his cruelty, Irenaeus attesting the innocence of Libanius. In like manner he happily escaped another calumny, by the favour of duke Lupicinus, when he was accused by his enemy Fidelis, or Fidustius, of having written an eulogium on the tyrant Procopius. He was not, however, totally neglected by Valens, whom he not only celebrated in an oration, but obtained from him a confirmation of the law against entirely, excluding illegitimate children from the inheritance of their paternal estates, which he solicited from the emperor, no doubt for a private reason, since, as Eunapius informs us, he kept a mistress, and was never married. The remainder of his life he passed as before mentioned, at Antioch, to an advanced age, amidst various wrongs and oppressions from his rivals and the times, which he copiously relates in his life, though, tired of the manners of that city, be had thoughts, in his old age, of changing his abode, as he tells Eusebius. He continued there, however, and on various occasions was very serviceable to the city, either by appeasing seditions, and calming the disturbed minds of the citizens, or by reconciling to them the emperors Julian and Theodosius. 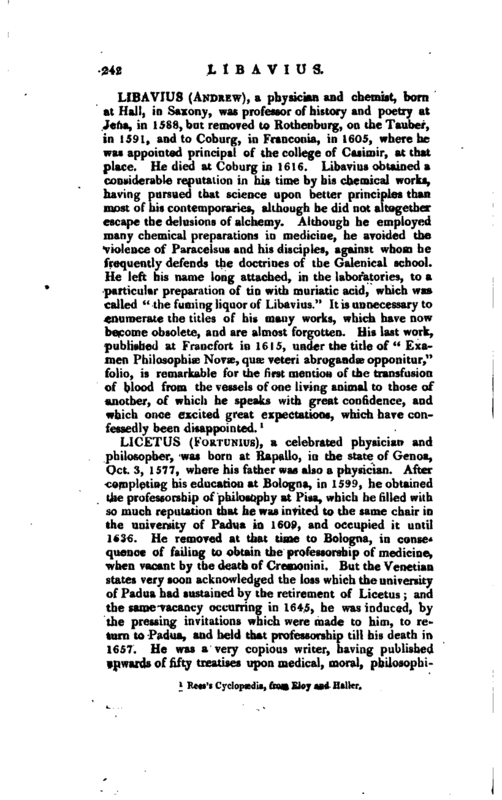 That Libanius lived even to the reign of Arcadius, that is, beyond the seventieth year of his age, the learned collect from his oration on Lucian, and the testimony of Cedrenus; and of the same opinion is Godfrey Olearius, a man not more respectable for his exquisite knowledge of sacred and polite literature than for his judgment and probity, in his’ ms prelections, in which, when he was professor of both languages in the university of his own country, he has given an account of the life of this sophist. The writings of Libanius are numerous, and he composed and delivered various orations, as well demonstrative as deliberative, and also many fictitious declamations and disputations. Of these Frederic Morell published as many as he could collect in 2 vols. folio, in Greek and Latin. In the first vol. Paris, 1606, are XIII “Exercises” (Progymnasmala) XLIV “Declamations;” and in “Moral Dissertations” and in the second vol. Paris, 1627, are the “Life of Libanius,” and xxxvi other orations, most of | them long and on serious subjects. This edition of Morcll having long been discovered to be very erroneous, the learned Reiske undertook a new edition, collated with six Mss. which he did not live to complete, but which was at last published by his widow in 1791—1797, 4 vols. 8vo. 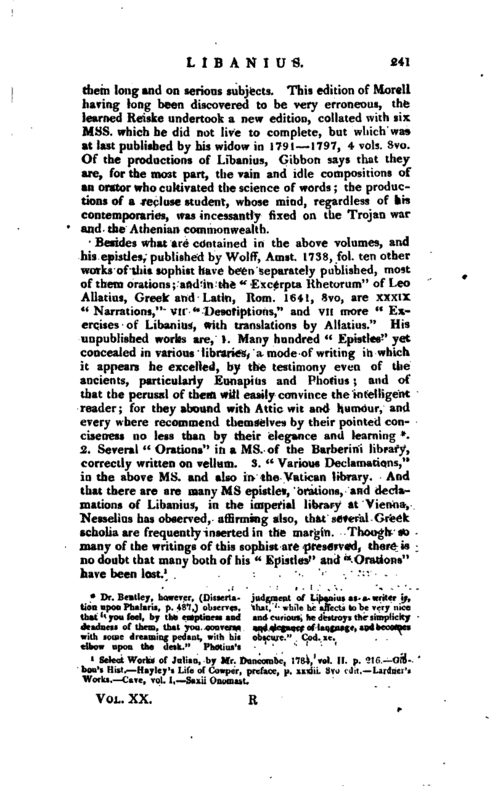 Of the productions of Libanius, Gibbon says that they are, for the most part, the vain and idle compositions of an orator who cultivated the science of words; the productions of a recluse student, whose mind, regardless of his contemporaries, was incessantly fixed on the Trojan war and the Athenian commonwealth. Dr. Bentley, however, (Dissertation upon Phalaris, p. 487,) observes, that “you feel, by the emptiness and deadness of them, that you converse with some dreaming pedant, with his elbow upon the desk.” Photius’s judgment Of Libanius as a writer is, that, “while he affects to be very nice and curious, he destroys the simplicity and elegance of language, and becomes obscure.” Cod. xc. Select Works of Julian, by Mr. Duncombe, 1784, vol. II. p. 216. 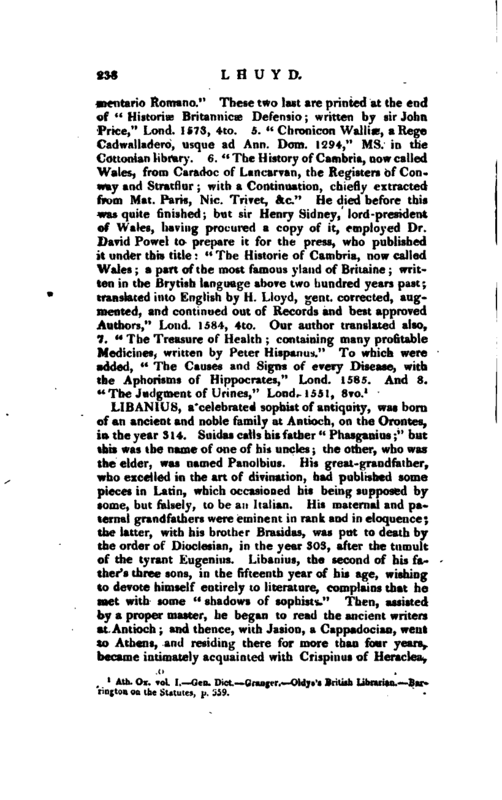 Gibbon’s Hist. Hayley’s Life of Cowper, preface, p. xxxiii, 8vo edit, Lardner’s Works. Cave, vol. I, —Saxii Onomast.